This delicate area is one of the first features to show your age. Fortunately, the heavy bags, sagging skin and crow’s feet can be easily improved through eyelid surgery Boca Raton with esteemed facial plastic surgeon, Dr. Mark Murphy. By making subtle alterations to the skin around your eyes, he can refresh your entire face and restore an open and more youthful overall appearance. 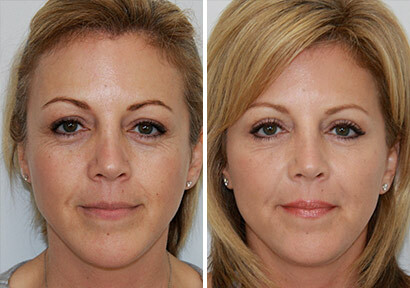 An extremely delicate procedure, our West Palm Beach blepharoplasty requires a high level of skill and artistry. The eyes are the key feature that allow others to gauge your mood and age. You have to be able to trust that your surgeon has the ability to make subtle alternations that adequately address your telltale signs of aging, but look extremely natural. This conservative yet effective approach is exactly what Dr. Murphy is known for. To begin your eyelid surgery Boca Raton, Dr. Murphy will create small incisions below your lower lashes, hidden within the natural creases of your eyelids so that your scars are virtually imperceptible once you have fully healed. Through those openings, he will remove precise amounts of skin, fat and muscle until he’s improved your heavy bags, elevated your sagging skin and smoothed any wrinkles. He will then create small incisions hidden within the creases of your upper eyelids. Through those openings, he’ll remove excess skin and alter the surrounding muscles, before subtly elevating your eyelids to a more youthful position. Once he has rejuvenated your eyes and achieved a bright and well-rested expression, he will carefully close the incisions to ensure that the resulting scars are very difficult, if not impossible, to see. Of all the surgeries Dr. Murphy performs, the recovery for his West Palm Beach eyelid surgery is typically the easiest. In most cases, our patients in West Palm Beach and Boca Raton will have their sutures removed in 3 days with some mild bruising and swelling for about a week. Immediately after the procedure, it’s normal to experience sensitivity to light, puffiness, swelling and bruising. All of these effects may last for several days, however they will disappear gradually as your body recovers. In the meantime, Dr. Murphy will instruct you to apply cold compresses to reduce swelling, use drops to maintain the health of your eyes and take pain medication as directed to manage any discomfort. In a few days, we will have you return to our Palm Beach Gardens office so Dr. Murphy can remove your stitches and evaluate your progress to ensure that you’re healing properly. At that point, he’ll provide you with personalized guidance regarding when it’s safe for you to resume your normal daily routine and activities without any restrictions.